Spring Training baseball is fantastic. Past and future All-Stars on the field together. Players signing autographs and actually having fun. I remember vividly attending Tigers spring training in Lakeland, Florida, in 1987 and I stuck around the stadium long enough to get Chet Lemon’s autograph. It was (and is) more valuable to me than one from Barry Bonds or virtually anyone else for that matter. But are Spring Training games meaningless, or can they actually inform how teams will do in the regular season? I looked at pre-season and regular season records in 2010 to see if I could find a correlation. 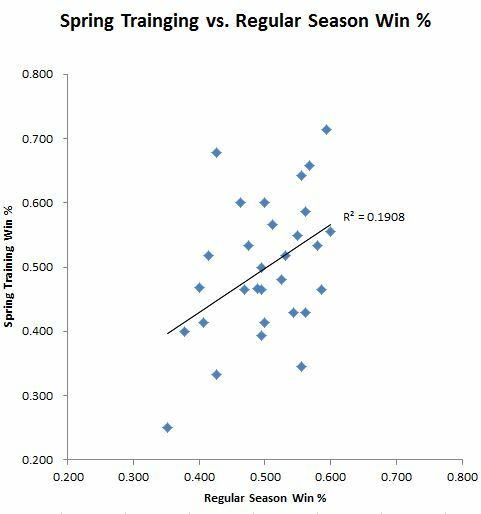 I plotted teams’ Spring Training record on the Y-axis, and their regular season record on the X-axis. At first glance, there wasn’t much correlation (R-squared value of 0.1908). But I dug deeper. 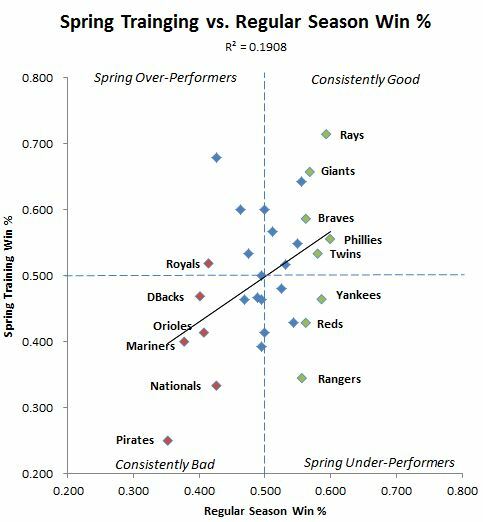 While overall Spring Training record is not a good indicator, perhaps it could identify a last place team or a playoff team. I isolated the playoff teams and the last place teams of each division to see if they were more likely to be grouped together. Indeed, this view is more telling (last place teams in red, playoff teams in green). For last place teams, the correlation was stark. Five of the six last place teams had a sub-0.500 Spring Training win percentage. They were consistently bad. For playoff teams, the correlation was not quite as strong, but still noticeable. Five of the eight playoff teams finished Spring Training with above-0.500 records. What does this mean for Spring Training teams this year? Finishing above 0.500 is a strong positive indicator, but a below-average finish doesn’t preclude the team from making the playoffs. For teams that finish under 0.500, all is not lost, but it doesn’t look good. Based on 2010 averages, a team that finishes under 0.500 has a 33% chance of finishing in last place, but only a 20% chance of making the playoffs. For teams that finish above 0.500, things look much better. Based on 2010 averages, they have a 33% chance of making the playoffs, and only a 7% chance of finishing in last place.